There’s little doubt in the mind of a collector that when it comes to “high-end” trading cards, Upper Deck is king. From the first certified autograph in 1990 and the first “game-used” relic in 1997, Upper Deck has always been pushing forward trying to come up with the next great idea. Guess which company produced the first ever Babe Ruth bat relic and cut signature? You guessed right; the boys in Carlsbad did it way back in 1998. That being said, times are freakin’ hard for many collectors these days. I know that personally, I’ve had to put down those boxes of 2008 Premier for a couple of packs of First Edition. OK, well it’s not that bad but you get the point. The truth is you don’t have to quit collecting or start buying the ultra low-end products to stay afloat in the hobby. Sometimes, heck many times, the best products are found in older and long-forgotten products. The misconception about “old school” wax is that it is full of overproduced cards that have not aged well design-wise. That is absolutely not true. For example, take a look at Upper Deck’s brilliant 1996 SPx debut. For years, Upper Deck had been tinkering with holograms and using the technology for inserts. But this was the first all-hologram release, and it worked incredibly well. Unopened boxes of ’96 SPx can be had for about $60 dollars on the secondary market, if you are patient. 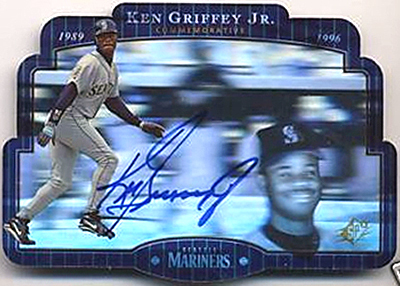 Not only is SPx a great product full of cool parallels and a beautiful base card design, it also has extremely hard to find on-card certified autographs of the immortal Ken Griffey Jr. and the most prolific catcher of all-time, Mike Piazza. Now, don’t assume that just because you find a box or two of the set that you will end up with one of these bad boys. These cards were seeded on average of once in every 2,000 packs. Unlike today’s cheap standards of a “hit” per pack or 2-3 per box, pulling one of these cards was like winning the Baseball Card Lottery. There is something out there for everyone in the hobby, whether you collect the expensive stuff like Ultimate & Premier, the retro-themed products like Goodwin Champions & Goudey, or just build one set of the 20-year old flagship brand as a collecting tradition that began long ago in 1989. There truly is no wrong way to collect, and ripping through one of these “old school” boxes can bring hours of enjoyment to young and old alike. It also provides a history of baseball, its players from that era, and card technology that has come and gone. Stay tuned for another installment of Wax to the Future in September! Mario Alejandro is the author of WaxHeaven.com, and has been collecting baseball cards since 1989. When not scouring through card shows looking for old school Upper Deck wax, you can find him burning away at a Marlins game in sunny South Florida with his wife and 3-year old son/future collector. I was collector until I got married. Hmm..go figure, you trade one hobby for another. Anyways, I love baseball and I know how hard it is to collect even the grade ‘A’ cards (I like to call them) is. Also, have you checked out the new 3D baseball card player technology they are working on. That looks awesome.